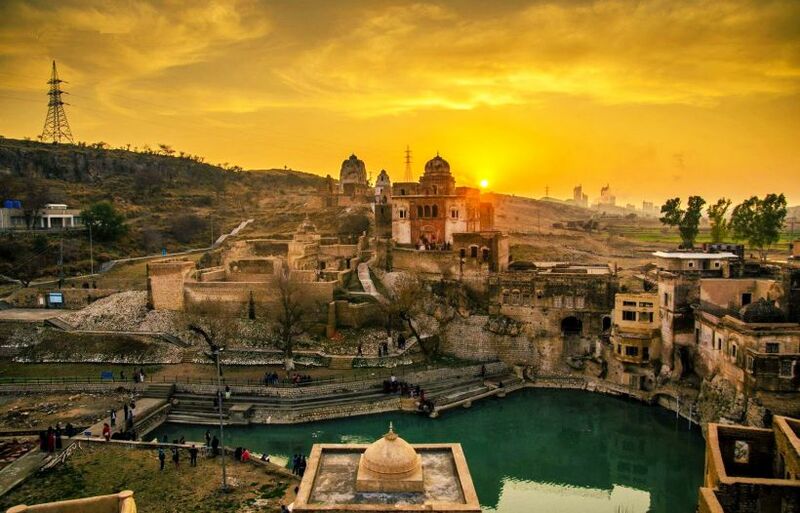 Katasraj Mandir (کٹاس راج مندر‎) is a Hindu temple complex situated in Katas village near Choa Saidanshah in the Chakwal district of Punjab in Pakistan. The main temple is dedicated to Lord Siva and has existed since the days of Mahābhārata and the Pandava brothers spent a substantial part of their exile at this place. Another legend involves the death of Lord Siva’s wife Sati; the story goes that when she died he cried so much and for so long that his tears created two holy ponds – one at Pushkara in Ajmer and the other at Ketaksha, which literally means “raining eyes” in Sanskrit. It is from this name that the word Ketas is derived and later became Katas. Another version of the legend mentions the two pools at Katasraj and Nainital. Pakistan Government is now considering to nominate the temple complex for World Heritage Site status. In 2007, it also proposed to restore the temple complex. From 2012 the temple pond is drying up due to heavy use of ground water for industrial purposes. 2 semi-ruined temples of the Hindushahiya period (650–950 AD) and few more built 900 years ago exist along with main old temple. Katas site houses the Satgraha, a group of seven ancient temples, remains of a Buddhist stupa, a few medieval temples, havelis and some recently constructed temples, scattered around a pond considered holy by Hindus. The Ramachandra Mandir is situated to the east of the Hari Singh Haveli and is closed from all sides except for an entrance on the east. The double-storied structure has eight rooms of various dimensions on the ground floor and a staircase at the south leading to the first floor. This mandir has two jharokas (balconies) that have been severely damaged. The Hanuman Mandir is on the western extreme of a high rectangular enclosure with entrances on the south and the north. The temple’s ceiling is undecorated, and lime-plastered. The Siva temple is also built on a square platform. Its entrance is a recessed round arch with faint cusps and a rectangular opening to the north. Local hindus have migrated to East Punjab in India after partition in 1947 and abandoned these temples. After that, temple complex went into bad state. The holy pond was littered with garbage, while the murals inside the temples disappeared due to the ravages of time and the neglect of the authorities. In 2006-07, Pakistan decided to place murtis of Hindu gods in the seven mandirs and restore them to their original state to attract visitors with budget allocation of Rs. 51.06 million. Pakistan government decided to import idols of Hindu gods from various monuments in India to Pakistan for the restoration. A 3-member archaeological team visited neighbouring India, Sri Lanka and Nepal to collect murtis of Hindu gods. 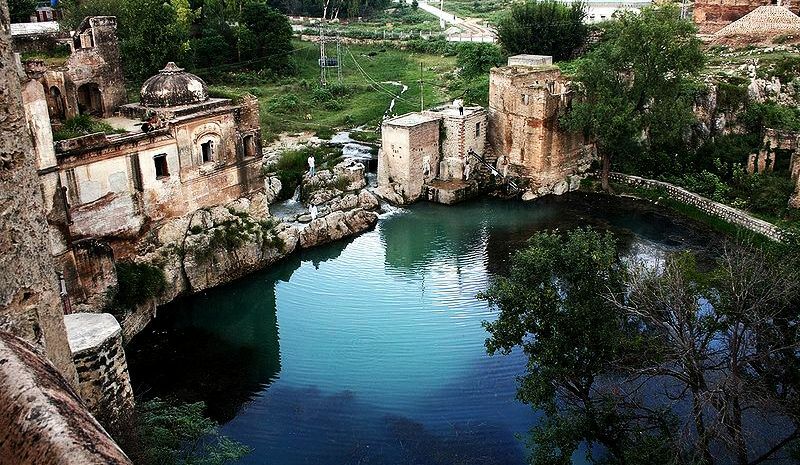 Katasraj mandirs are located 40 kilometres from Chakwal District. It takes a little effort to reach Katasraj by road – one has to go off the M2 motorway – (Islamabad- Lahore) at the Kallar Kahar interchange, Then follow the road to Choa Saidan Shah for 24 km and after passing the cement factory the road passes through the temple complex, with the major temple complex and the pond on the right. Prehistoric tools and weapons such as axes and knives made of granite, and artifacts like terracotta bangles and pottery have been unearthed at the Katasraj site. The latter have been found to be similar to those excavated in Harappa, but have not been dated for want of expert opinion. The fascinating Salt Ranges have a vast archaeological treasure still hidden underground. The Salt Ranges have also been yielding prehistoric finds. While some local experts place the fossils discovered in the period between 6000 and 7000 BC, the fact remains that they have not yet been examined by trained palaeontologists of international standing. A large number of bones of the limbs and vertebrae of giant animals resembling the extinct mammoth and dinosaur have been found at some sites.